The chipotle paste gives this dish a hot, smoky Mexican flavour. Starting the pork in the oven and finishing it on the barbecue makes it ideal for summer. Place the barbecue sauce ingredients in a medium sized pan, stir gently and bring to the boil. Simmer for 5 minutes until the sugar has dissolved. Allow to cool. Light the barbecue (if using) and preheat the oven to 190°C, gas mark 5. Roll each pork belly slice up and secure each roll in place with 2 metal skewers. Place in a shallow ovenproof dish and pour the sauce over. Turn to coat. Cover the pork with foil and place in the oven for 20 minutes, then turn and cook for a further 25 minutes. Meanwhile, cut each sweet potato into 8 long wedges and place in a roasting tin. Mix the oil and Cajun seasoning together, drizzle over the wedges and toss well to coat completely. Place in the oven for 25-30 minutes, turning once, until the potatoes are tender when pierced with a fork. Alternatively cook on the edge of a barbecue for 25-30 minutes, turning occasionally. Place the pork slices under a preheated hot grill or on the barbecue and cook for 5 minutes each side, basting with the sauce, until golden and crispy. 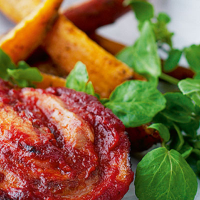 Remove skewers, serve with sweet potato wedges and a fresh watercress salad. For extra flavour, marinate the pork in the sauce for 3-4 hours or overnight in the fridge. If you like a really spicy flavour, add a little more chipotle paste.